Step 1 Configure MWI On and MWI Off. Step 2 Configure the voice-mail ports. Step 3 Configure the line group. Step 4 Configure the hunt list. 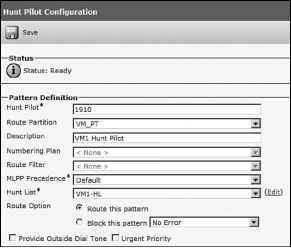 Step 5 Configure the hunt pilot. Step 6 Configure the voice-mail pilot. Step 7 Configure the voice-mail profile. NOTE Steps 2 and 3 can be performed by using the Cisco Voice Mail Port wizard. The Cisco Voice Mail Port wizard allows quick configuration of a high number of voice-mail ports by specifying the number of voice-mail ports to be created. The voice-mail ports are added and assigned to a line group. All other steps have to be performed manually. You can access the Cisco Voice Mail Port wizard from Voice Mail > Cisco Voice Mail Port Wizard. Step 1 In CUCM Administration, go to Voice Mail > Message Waiting and click Add New. Step 2 Configure a message-waiting number and description and set the MWI to On. Step 3 Repeat the preceding step to create a message-waiting number for MWI Off using a unique number. The MWI On configuration is displayed in Figure 18-8. A partition at a message-waiting number specifies what devices are allowed to dial the MWI number. Voice-mail ports are the only devices that should be dialing the MWI On or MWI Off codes. The CSS at the voice-mail ports must include the partition of the MWI numbers. Step 1 In CUCM Administration, go to Voice Mail > Cisco Voice Mail Port, and click Add New. 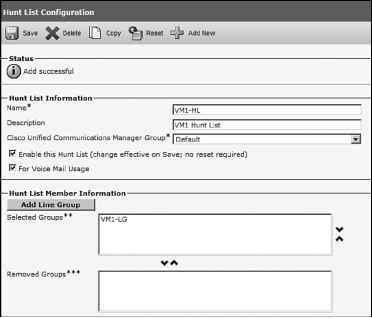 Step 2 Configure the voice-mail port with a port name and description and select a device pool. The port name must have a suffix of VIx, where x is a number starting with 1 for the first voice-mail port and incrementing by 1 for each additional port. Step 3 Set the device security mode. NOTE The device security mode is a mandatory parameter and does not have a default value. Therefore, it must be selected. If the CUCM cluster has not been enabled for security, the device security mode must be set to Non Secure Voice Mail Port for the voice-mail port to function correctly. To enable security in the CUCM cluster, additional hardware products (security tokens) have to be purchased, and the cluster has to be configured for secure operation. More information about how to enable security in a CUCM cluster is provided in Cisco Unified Communications IP Telephony, Part 2. Step 4 Enter a DN for the voice-mail port. NOTE The DN of a voice-mail port should not use a number from the DID block purchased from the PSTN service provider. The DNs of the voice-mail ports will not be dialed directly. The hunt pilot will distribute calls to various voice-mail ports after the ports have been placed into a line group. The hunt pilot should be in a DID range to enable roaming users to dial the voice-mail pilot point directly over the PSTN. Step 5 Repeat the preceding steps to configure additional voice-mail ports. The CSS of a voice port is composed of a device and line CSS. The combined CSS must allow calls to subscriber phones and any other number where the voice-mail system may perform message notification. These can be internal phone DNs, route patterns, MWI numbers, or any dialable PSTN pattern for message notification. Figure 18-9 shows the Voice-Mail Port Configuration window. Step 1 In CUCM Administration, go to Call Routing > Route/Hunt > Line Group, and click Add New. 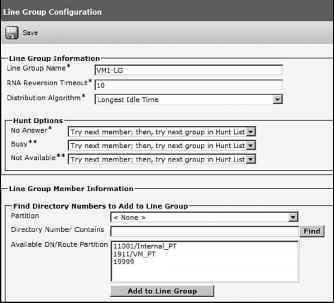 Step 2 Enter a name for the line group, select the top-down distribution algorithm, and add the previously configured voice-mail ports to the line group. NOTE If some voice-mail ports will be used in Unity for dial out only (call transfer, message notifications, or message-waiting indication), they must not be included in the line group. The line group should contain only the voice-mail ports that are used to answer calls to the voice-mail system and automated-attendant system. Step 1 In CUCM Administration, go to Call Routing > Route/Hunt > Hunt List, and click Add New. Step 2 Enter a name and description for the hunt list and select a CUCM group. Step 4 Add the line group that was configured in the previous step to the hunt list. Figure 18-11 shows configuration of the hunt list. Step 1 In CUCM Administration, go to Call Routing > Route/Hunt > Hunt Pilot, and click Add New. Step 2 Enter the hunt pilot number. This is the number that the voice-mail system will reach for forwarding calls and for message retrieval. Step 3 Enter a description for the hunt pilot. Step 4 Select the hunt list that was configured earlier. The partition of the hunt pilot places the hunt pilot number in a container. All devices that should be able to call the voice-mail system need to have this partition in their CSS. Users of Cisco IP Phones with a Voice Mail button will dial the hunt pilot number directly by pressing the Voice Mail button of the phone. The Voice Mail button dials the voice-mail profile's associated pilot point number. The pilot point number is the same as the hunt pilot. The phone does not need to access the hunt pilot number from its CSS because the phone will dial the DN associated with the voice-mail profile of the DN. The voice-mail profile must dial the hunt pilot. Figure 18-12 is a screen capture of the hunt pilot configuration in CUCM. Step 1 In CUCM Administration, go to Voice Mail > Voice Mail Pilot. Click Find, and choose the Default voice-mail pilot. Step 1 Configure the voice mail pilot number with the same extension used on the hunt pilot. Click Save. NOTE Two voice-mail pilots exist by default: the Default voice-mail pilot and the No Voice Mail voice-mail pilot. If only one voice-mail system is used, it is recommended to configure the Default voice-mail pilot. If multiple voice-mail systems are used, additional voice-mail pilots must be added. The No Voice Mail voice-mail pilot does not refer to any hunt pilot because it is only referenced from voice-mail pilots, which do not allow voice-mail integration. The CSS of the voice-mail pilot is used for the voice-mail pilot to access the configured voice-mail pilot number (hunt pilot number associated with voice-mail profile). Figure 18-13 illustrates the voice-mail pilot configuration. To configure a voice-mail profile, refer to the previously configured voice-mail pilot, and in CUCM Administration, go to Voice Mail > Voice Mail Profile. Click Find, and choose the Default voice-mail profile. From the Voice Mail Pilot drop-down list, select the previously configured voice-mail pilot. The voice-mail profile configuration is shown in Figure 18-14. Voice-mail profiles are used only by Cisco IP Phones when the Voice Mail button is pressed; they are ignored when a user dials the voice-mail pilot number directly. What is a cisco voicemail profile? How to integrate Unity with CUCM step by step?